Epclusa Cost, Side effects, Dosage, Uses for Hepatitis C infection. Epclusa is manufactured and marketed by Gilead Sciences, Inc., of Foster City, California. Epclusa is first kind drug approved by US FDA for the treatment of all six major HCV genotypes. 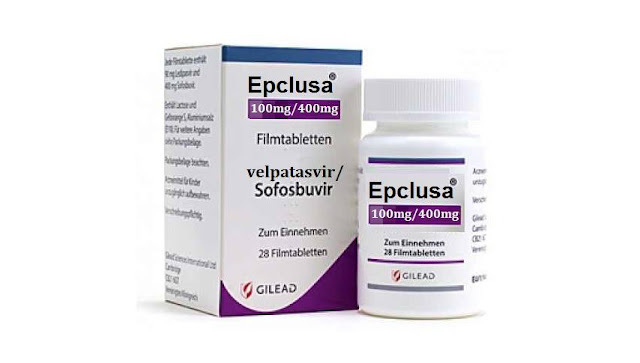 Epclusa contains combination of sofosbuvir, a drug approved by FDA as break through therapy for HCV and velpatasvir, a new drug, and is the first to treat all six major forms of HCV. US FDA approved this drug on July 28 2016 for the treatment of chronic type of hepatitis in adult patients with cirrhosis or without cirrhosis. If liver cirrhosis progresses to advance stage then Epclusa is used with antiviral drug called as ribavirin. Hepatitis C is a viral infection leads towards liver cirrhosis if it persists for a long term. HCV virus has 6 genotypes 1 to 6. Each genotype requires duration of therapy and in some cases therapy may also be changed. In United States about 75% people have genotype 1 that means genotype 1 is the most common type in United States of America. Genotype 2 has prevalence rate of 25%. Other genotypes are less common and only few patients are diagnosed with such kind of genotypes. There are two types of side effects that were observed during Epclusa clinical trials like moderate and severe type of side effects. Epclusa may interact with some other drugs for example it should not be used with amiodarone due to increase cardiac risks like rapid fluctuations in heart rate, severe bradycardia and cardiac arrest. Some drugs may reduce the serum level of epclusa which will reduce the efficacy of drug. Epclusa is prescribed for the treatment of chronic HCV infection in adults having liver cirrhosis or do not have liver cirrhosis. It indicated for all kinds of HCV genotypes because it contains combination of drugs. Up-till now, Epclusa is only regimen to treat all six major HCV genotypes effectively. This drug is presented to FDA in tablet form (oral dosage form) with potency 400mg/100mg (Sofosbuvir 400mg and velpatasvir 100mg). According to market survey price of epclusa is variable but approximate average cost of one pack of epclusa ranges between 24,000$ - 26,000$. One pack of epclusa contains 28 tablets ( 28's pack size). This price may variate with the passage of time so, make it confirm by visiting your nearby pharmacy before purchasing. This drug is indicated for chronic hepatitis C in adults with genotype 1,2,3,4,5 and 6. According to clinical data provided by health authorities the dosage frequency is once a day through oral route (PO). Duration of therapy depends upon patient liver condition and genotype. However, average duration of therapy is between 4-6 months. This drug my be used in combination with other antiviral drugs for targeted therapy.